The English derives its name from the English (unofficial) World Champion, Howard Staunton (1843). The English has caught on in the twentieth century and is now recognized as a solid opening that may be used to reach both classical and hypermodern positions. Although many lines of the English have a distinct character, the opening is often used as a transpositional device in much the same way as 1.Nf3 – to avoid such highly regarded responses to 1.d4 as the Nimzo-Indian and Grunfeld defences – and is considered reliable and flexible. 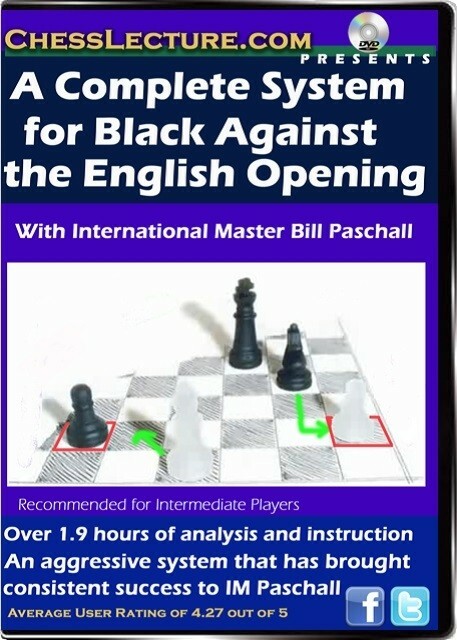 Content: 115 minutes of chess theory and discussion, with example games, over a series of 4 lectures. Fans on ChessLecture.com said: Well, I watched part 1 today and enjoyed it so much that I watched part 2 immediately afterwards. Excellent lecture series and I amlooking forward to parts 3 and 4 which I will watch tomorrow. IM Bill Paschall: currently resides in Budapest, Hungary. 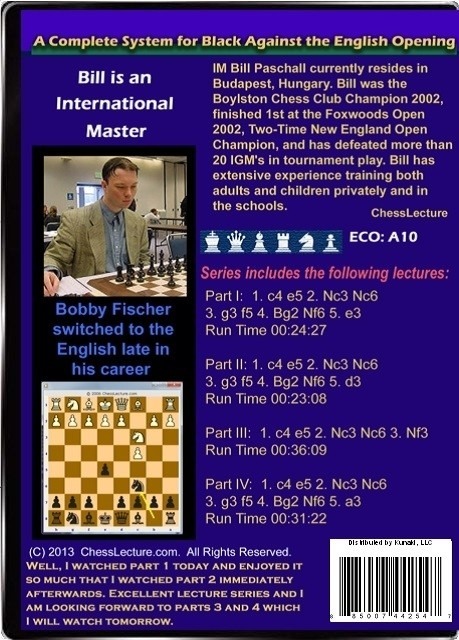 Bill was the Boylston Chess Club Champion 2002, finished 1st at the Foxwoods Open 2002, Two-Time New England Open Champion, and has defeated more than 20 IGM's in tournament play. Bill has extensive experience training both adults and children privately and in the schools.